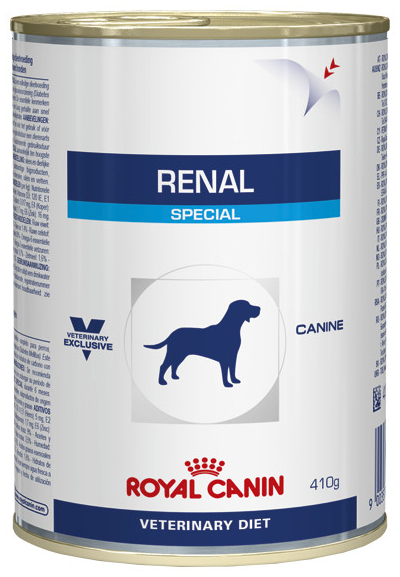 Royal Canin Renal Special (RSF 13) is a complete dietetic dry food for dogs which has been formulated to support renal function in cases of temporary or chronic renal insufficiency by providing high quality protein and low levels of phosphorus. The Royal Canin Renal Special diet has been created with a specially formulated aromatic profile to provide a different taste, aroma and texture to the standard Renal diet. A veterinarian’s opinion should be sought before first use or extending the usage period. Chronic renal insufficiency should require feeding Renal Special for up to 6 months. Temporary renal insufficiency should be met with a period of 2 to 4 weeks feeding. Rice, maize flour, animal fats, maize, dehydrated poultry protein, hydrolysed animal proteins, beet pulp, wheat gluten*, minerals, fish oil, vegetable fibres, soya oil, fatty acid salt, fructo-oligo-saccharides, psyllium husks and seeds, marigold extract (source of lutein). Vitamin A: 15700 IU, Vitamin D3: 1000 IU, E1 (Iron): 40 mg, E2 (Iodine): 4 mg, E4 (Copper): 12 mg, E5 (Manganese): 52 mg, E6 (Zinc): 154 mg, E8 (Selenium): 0.05 mg - Technological additives: Clinoptilolite of sedimentary origin:5 g - Preservatives - Antioxidants. Meat and animal derivatives (chicken,pork), cereals, fish and fish derivatives (salmon), oils and fats, derivatives of vegetable origin, minerals, various sugars. Vitamin D3: 210 IU, E1 (Iron): 15 mg, E2 (Iodine): 0.58 mg, E4 (Copper): 4.6 mg, E5 (Manganese): 4.7 mg, E6 (Zinc): 47 mg - Technological additives: Cassia gum: 4 g, Clinoptilolite of sedimentary origin: 0.4 g.
Below are some recent questions we've received regarding Royal Canin Canine Veterinary Diets Renal Special Dog Food, including answers from our team. I have just received my latest order for renal food. I have been ordering renal clinical, but mistakenly ordered renal special for my dog who has chronic kidney disease. Is it ok to give the special food? What is the difference. Thank you. This should be a perfectly appropriate alternative food for your dog, though ideally you should check with your own vet regarding specialist diets for your dog. The main difference from your usual diet is the flavouring, the nutritional profile should be the same. Is it ok to give my dog a daily carrot while on a renal diet. Yes this is fine. Animal proteins are best avoided, but carrots are fine.